being MVP: New Year, New Home Event: Kidco & Giveaway! New Year, New Home Event: Kidco & Giveaway! Welcome to the New Year, New Home Event hosted by Being MVP, Baby Dickey and Coping with Frugality. We are excited to introduce you to some awesome brands with products that are perfect for your new (and current) home. Next Up is KidCo! When moving into our new home with a toddler and a baby who is going to crawl soon, the first thing I was concerned about was safety. Why? Beyond the fact that we are in a 3 story, there are hazards galore! I was relieved to have received the Metro Gateway G170 Pressure Mount Gate from Kidco. We received the extension for the gate and I used one on the right. The gate was fairly easy for me to put together given there are no written instructions (only diagrams). No tools are needed and the gate simply adheres to the wall with the four pressure mounts. I love the modern look of the aluminum and black and it fits in perfectly with our space. The gate is pretty sturdy as I pushed and pulled to make sure. It's simple to use: push on the tabs, lift up on the bar, pull up on the gate and voila open! To close you just push the date down until level with sides and close bar. It does take some time in getting used to a gate being there after 3 weeks without one. I decided to use this right next to playroom because I didn't want Kenzie to go up the stairs without me supervising and/or holding her hand. It's easy to use, looks fabulous and keeps the kiddos safe. We also received one universal outlet cover, stove knob stop and foam edge and corner protector. I love the outlet cover as it does a better job than the caps we have. Plus Kenzie can't yank this out (& Mason once he is mobile) and we don't have to remove to plug something in. I love that it automatically closes once you take your plug out - very handy for the vaccum. 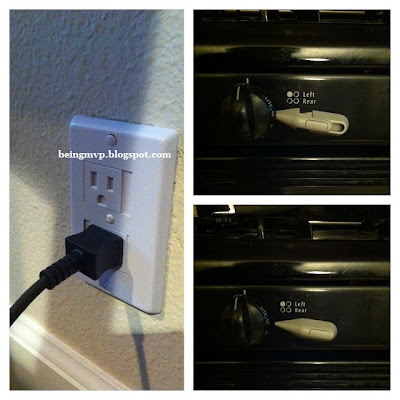 We are going to have to get these for all the outlets in the house! The stove knob stop is fantastic as well because Kenzie is so inquisitive as to the what is cooking on the stove. Just the other day she moved around a spatula in a pan: danger! The foam protector is fantastic will be perfect for once we purchase a new coffee table (I got rid of it when Kenzie started walking because I didn't want her to get hurt). Buy It: You can purchase Kidco products online as well as retail stores so check it out. Make sure to connect with KidCo on Facebook and Twitter! Gate/Safety Products from the Three Participating Blogs! I could definitely use the Cabinet Locks! My 15 month old is a busy body! I love the go pod in cardinal! I like the angle mount wood safety gate and the tv strap. I love The Go Pod!! I love the Pistachio Go-Pod! I would love to try the go pod! I really love the safety gate and the cabinet locks. I would also like the BabySteps Food Mill! I like the bed rails. I'd like the electrical outlet caps. I like the Bath Storage Basket. The Go-Pod would be great - especially on our trips to visit the grandparents! wood bed rail would be great for moving dd to big girl bed! I'd love to try some of the locks and latches, as my grandson can figure out how to open anything! I could use some bed rails! The GoPod is pretty neat. I like the Go·Pod, pretty cool. I have been wanting the Go pod forever!! i would like to try the bed rails! I actually like the Go Pod. I love the gopod. how cool!! I like the GO-POD in Cardinal! The BabySteps Electric Food Mill looks very nice! I like the Go-Pod — P7002 Pistachio. How handy! I would love the Baby Steps Natural Feeding System!